The Pretani Education Programme – Government of Ireland. 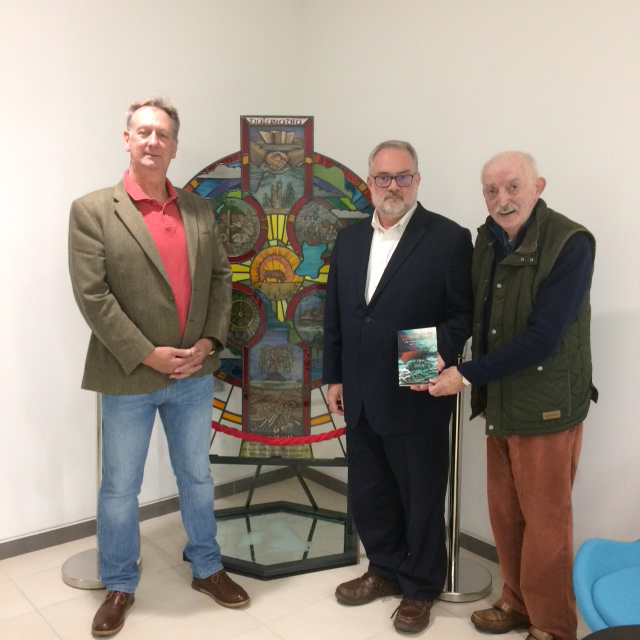 Dr Ian Adamson OBE of Pretani Associates and Robert Williamson, Chairman of Dalaradia, were delighted to present a copy of A Voyage to the Immortal Isles, The Voyage of Bran, Son of Febal to Kevin Conmy, Joint Secretary, Department of Foreign Affairs and Trade, Ireland. The book uniquely contains a translation of Old Gaelic into Ullans or Ulster Scots. The presentation was made before the Dalaradia Cross, presently situated at the Irish Secretariat, 40 Linenhall Street, Belfast. Discussion took place on how the Irish Government could play a more prominent role in the preservation and promotion of Ulster Scots Language and Culture within the island of Ireland.